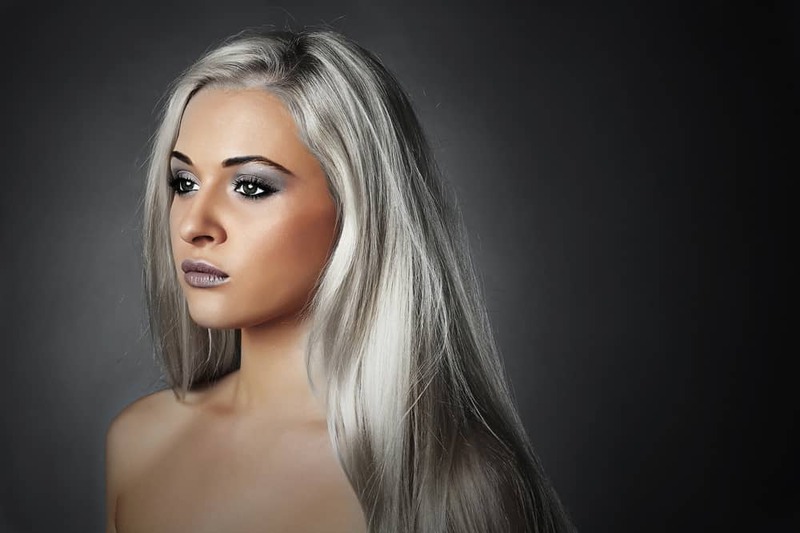 Silver hair with a metallic sheen is trending big time right now. Actually, there are many different metallic colors (we list them below our main gallery). If you’re thinking about going with a metallic sheen, you’ll love our comprehensive gallery below that provides loads of examples. Love the platinum waves of the hairstyle! Definitely a stunning pixie cut. This style is perfect for women over 60 with round shape faces. This pixie cut with metallic balayage is a good upgrade for women over 60 who loves this hairstyle. The brand new Violet Metallics looks so elegant and gorgeous! Want to keep your simple straight hair? At least add a flavor to it by throwing in a metallic shade, and in this moment, the metallic blue finished the stunning job. This stunning metallic pastel hair is designed after the milkshake trend and the result looks awesome. This is a classic type of metallic hair and still one of the most popular. The grey melt mixed with metallic honey beige is a stunning view! The electa is so beautiful on metallic and looks oozing with positive energy. The icy silver blonde is probably my personal favorite. It's so gorgeous and stunning. The silver brown color in medium hair added by beautiful waves can make anyone go gorgeous. When @kelsbrophy said she wanted “sherbet” hair....I was like “you’re speaking my language.....anything SUGAR related, I’m IN”. . . I used her existing balayage and overlaid custom mixed @pulpriothair and @joicointensity with @olaplex. This hairstyle adds sweetness perfect for every sweet girls. A total sugar gravy! This long wavy and braided hair styled with metallic blonde color looks perfect for going elegant style. Wavy short hair combined with metallic flair looks cool and awesome. Silver metallic has always been a great go-to style if looking for a stunning look. Metallic lilac is always a very stunning style even with straight hair type. Great hairstyle if you're looking to go metallic. The waves and the color look so good with each other. This metallic style frosty hair is totally a slayer for short hair girls! Glossy titanium looks totally cool. It's very metallic. Metallic purple looks very good even in medium hair especially when trying to achieve a gothic look. How popular are metallic hair colors? While metallic silver may be the first to come to mind, it’s not the only type of metallic hair color. Check out our list with examples. Copper metallic hair color, which resembles the color of a penny, looks magnificent when applied to hair with a combination of light and dark undertones. Copper-colored metallic hair is one of the most popular metallic hair shades for women right now, as evidenced by the fact that it’s on the heads of multiple Hollywood celebrities. To make this look even more alluring, leave some of your natural dark strands untouched to create a contrast between your natural color and the copper tones. If your hair is naturally blonde, brown, or even red, rose gold is a great metallic shade to consider. This unusual shade features a winning combination of lighter silvery blonde tones with reddish-pink tones. Using a rose gold metallic hair shade is a great way to add a bit of spiciness and intrigue to your otherwise monotone shades of blond, red, or brown. Rose gold is an especially popular color for the fall season because of its resemblance to the changing autumn leaves. Seeing gray or silver hair on your head (or someone else’s) has historically been a dreaded sign of aging. In turn, graying hair was something that people quickly covered up. But today, having silver hair is a cool new trend thanks to the emergence of silver metallic hair shades on the market. It’s also a color that looks good on people of all ages, not just adults over the age of 50. Although silver metallic shades fall under the same category of color, there are many shades of the color to choose from. A lighter and more airy shade of silver metallic gives your head an ethereal, angelic, and romantic glow. A darker shade adds a bit of drama and attitude to your look. In addition to straight silver, some shades of metallic silver have hints of other color too, such as pink or white. If there was a popularity contest for hair colors, the winner would probably be blonde. And the leader of the blonde category is arguably platinum blonde, which is the lightest shade of blonde that you can get. A metallic shade of platinum blonde is great for adding a bit of shine and sparkle to your standard hair color. If you naturally have blonde hair, a platinum blonde metallic shade can make your hair look sleeker and healthier. Some shades of platinum blonde have hints of silver, which means that it can be a great color to add to your hair if you are starting to go gray. Like light shades of silver, platinum blonde can give your hair an enchanting and more youthful look. Another popular hair color, and one that is quite versatile, is called “ronze.” This shade is a combination of red and copper, which means that it is ideal for brunettes. The colors found in a ronze metallic shade are similar to rose gold, except that the color red plays a more prominent role in a ronze tone. While rose gold metallic hair has shades of pink, ronze has darker shades of red. This means that ronze is suitable for people with darker hair, while rose gold is a better option if your hair is naturally lighter in color, such as a light brown or blonde. Ronze also comes in a wide variety of shades, which means that it is easy to find a tone and color that is compatible with your existing hair color but still gives it a bit of a fresh new look. An auburn shade of metallic dye, which ranges in color from a medium to dark combination of red and brown, is a quite versatile color that works well with a number of eye colors and skin tones. If your hair is on the lighter side, a lighter shade of auburn is best. In contrast, if your hair is darker brown or black, then a darker shade of auburn is a better choice. Either way, auburn has just enough of a red tint to add an element of interest to your hair. Its red tones also add a bit of playfulness and spirit to your hair, which helps to lighten and liven up your look. – 🧡Big colour change for Claire🧡. . 🔥The new season is fetching the lovely warm autumn colours out and we are loving all these copper tones🔥. . .
An ombre color is a two-tone color that adds drama and character to your mane. The most common shade of ombre is a combination of red and silver. However, other tones are also available, such as red and blue or silver and purple. Ombre is a great choice if your hair naturally has multiple shades and tones, such as dirty blonde. It is also a good option if your hair is starting to go gray. An ombre metallic hair shade is also a practical choice if you can’t decide on one color and want to see how two of your favorite colors look on your hair. Another beautiful option for hair color is black metallic. A black metallic shade adds richness and shine to your dark hair, which in turn gives it a glowing look. Black metallic shades are packaged alone, as a straight black color, or in conjunction with another shade such as silver, blue, or even red or purple. Black metallic hair color can make your hair look healthier and shinier, which in turn makes it one of the most glamorous shades of metallic hair color that you can get. One of the most popular color combinations for black metallic hair is black and silver, which is a beautiful combination of shiny black that gradually transitions to dark silver strands at the ends of your hair. Another intriguing option for metallic hair dye is a pastel. Pastel colors like soft pink, green, and blue can give your hair an enchanting look. They are ideal for giving your hair a softer, more youthful, and more alluring appearance. Pastels are a versatile choice that go well with any hair color. They can beautifully complement graying hair or give light blonde an even more ethereal look. On darker hair, pastel dyes add some sparkle and shine and help brighten up your natural look with their lighter colors. The nice thing about pastel metallic shades is that you can experiment with multiple colors at once or swap them out for the changing season.